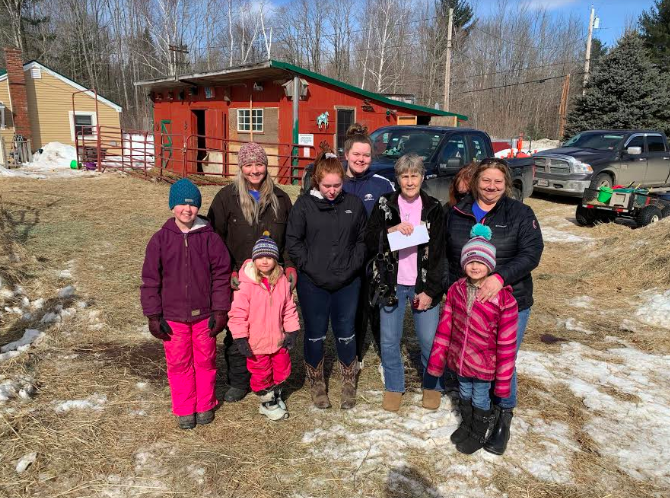 Franklin County’s two 4-H Horse Clubs collaborated in a community service effort to benefit the Double B Equine Rescue. INDUSTRY - Franklin County’s two 4-H Horse Clubs collaborated in a community service effort to benefit the Double B Equine Rescue. This would make Giddy Up and Go Club’s 12th Annual Hayraiser fundraiser and Dusty Boots Club’s 1st Annual Hayraiser fundraiser. The Double B Equine Rescue, located on Route 43 in Industry, Maine takes in surrendered, unwanted, neglected and abused horses and other equines from around the state and provides them with food, water, medical and rehabilitative care. Currently in their care are 36 equines. Donations were delivered over two different days, donations consisted of various items such as hay, grain, shavings, tack and related equipment, Tractor Supply gift cards and monetary donations. Of course, donations are greatly appreciated and accepted all throughout the year for the deserving minis, ponies, donkeys and horses who have been through so much. If you would like to make a donation of hay, grain, shavings, tack or equipment please contact Terri Pierce at 207-779-6774 via call/text and we will be sure to get your donation to the rescue. If you would like to make a monetary donation, please send a check made payable to Double B Equine Rescue to the UMaine Cooperative Extension, 138 Pleasant Street Suite #1, Farmington ME 04938. It is OK if donations are received before or after the 23rd. Members of Giddy Up & Go, Dusty Boots, The Double B Equine Rescue and the horses greatly appreciate your help and wish to thank everyone who has donated so far! As a trusted resource for over 100 years, University of Maine Cooperative Extension has supported UMaine's land and sea grant public education role by conducting community-driven, research-based programs in every Maine county. UMaine Extension helps support, sustain and grow the food-based economy. It is the only entity in our state that touches every aspect of the Maine Food System, where policy, research, production, processing, commerce, nutrition, and food security and safety are integral and interrelated. UMaine Extension also conducts the most successful out-of-school youth educational program in Maine through 4-H.